The past year proved -- yet again -- why we love politics. There was the sublime (the country and its politicians' reaction to the shootings in Newtown, Conn.) and the ridiculous (virtually everything else). We spent a few days gathering a series of pictures that tell the story of the year in politics. Our picks are below. What did we miss? 1. President Obama's second inauguration was the high point of his year. 2. Soon, scandal was everywhere. There was Benghazi. 3. There was the NSA. There was the IRS. And there was even "umbrella guy." 4. Things on the foreign policy front weren't much better. 7. The one piece of good news for President Obama was that Republicans in Congress were even worse off. 8. Ted Cruz became the face of the "no retreat, no surrender" crowd after leading a nearly 24-hour-long filibuster to stop President Obama's health-care law. 9. It didn't work. But it did lead to a government shutdown that Republicans got blamed for. 1o. All of which led to John Boehner's "Are you kidding me?" moment. 11. Add it all up and you get a Congress that's less popular than car salesmen. Yes, really. 12. Outside Washington, things weren't any better. Anthony Weiner did it again. 13. And the world met Toronto Mayor Rob Ford. 15. It wasn't all bad news for politics and politicians though. Chris Christie had a great year. 16. And New Yorkers fell in love with the de Blasio family. 17. Minnesota Gov. 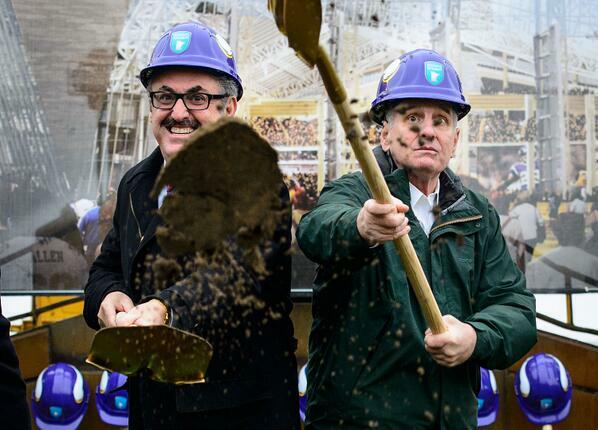 Mark Dayton looks like he is having a good time alongside Vikings owner Zygi Wilf. 18. And Joe Biden always has a good year. Always.